Writers: Fran Walsh, Philipa Boyens, Peter Jackson & Guillermo Del Toro, based on the novel by J.R.R.Tolkien. Cast: Martin Freeman, Sir Ian McKellan, Richard Armitrage, Cate Blanchett, Luke Evans, Orlando Bloom, Evangeline Lilly, Lee Pace, Hugo Weaving, and Christoper Lee. Synopsis: In the epic conclusion of the most unnecessary trilogies in recent history, CGI characters clash and fight for 2 hours. This review originally ran over in Central Track. Well, we made it. We reached the end of the of Lord of the Rings series -- at least for the time being. So, yeah, we know what we're dealing with: The Hobbit's 300-page source material was first slated to be turned two movies, and then it expanded to three movies -- supposedly to add new scenes from Tolkien's appendices that would more seamlessly then bridge the old LOTRtrilogy with this new one. Unfortunately, these changes have only resulted in a very uneven and ultimately shallow entry into this beloved series -- and, worse, one that hardly justifies its running period. 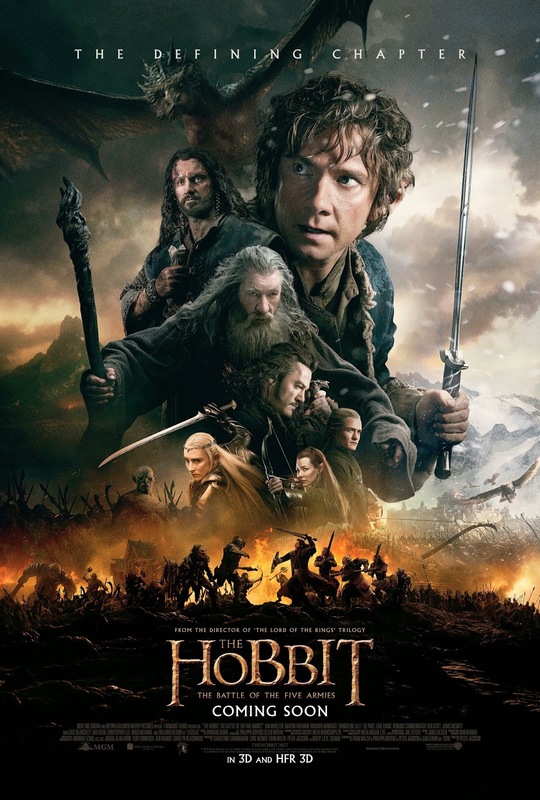 Starting off just seconds after the end of The Desolation of Smaug, The Battle of the Five Armies (or BOTFA) quickly moves to resolve the cliffhanger of the previous movie within the first 15 minutes. Then, immediately afterwards, there's an extended scene regarding a cowardly side character that contributes absolutely nothing to the overall plot. That's the first of many bad signs in BOTFA -- and a strong indicator that director Peter Jackson has lost the ability to tell the kind of evenly paced and complex story that he once did with LOTR. Here, there are just too many instances in which he chooses to focus on very minor details or to zero in on plots that are ultimately inconsequential to the overall arc. Of course, this has been a fairly consistent problem throughout this entire second trilogy. Jackson's excuse in this regard is that he wanted to make better use of those appendices andThe Silmarillion to better flesh out the relatively thin story of The Hobbit. While that is a very noble reason for stretching out a movie, the actual execution doesn't justify the move. Every time the movie switches to these secondary scenes, it's obvious -- it completely kills the momentum of the main story. It also doesn't help that the dialogue in these scenes are uniformly awkward. Another consistent error Jackson makes -- and a lesson he should've learned George Lucas -- is his call to forsake models and actual sets for gratuitous CGI armies and green screen environments. Compare that with the gritty battle of Helm's Deep from the original trilogy's second installment, The Two Towers, and the end result feels like you're in a video game that you can't control instead of the climactic culmination of two movies. Then again, not all of the CGI is unnecessary. The best scene in the movie is a fight between the nine ringwraiths who appear in the Lord of the Rings and Galadriel (Cate Blanchett), Elrond (Hugo Weaving), Gandalf (Ian McKellan) and Saruman (Christopher Lee). It's fast-paced, cleverly choreographed and visually stunning. Better yet, there's actual tension. And the ghosts are creepy as hell! As the climactic event of the movie, though, the titular battle of the five armies just doesn't hold up. The individual scenes and fights are very cool to look at, sure. But if you look at the way that the battle unfolds as a whole sequence, it really doesn't feel like a cohesive story. The whole thing is so intense and one-sided at the start that, when things finally do turn around for our heroes, it not only feels totally not earned but almost laughably so. The Hobbit has a knack for not putting its best foot forward. Throughout the trilogy, dwarf Thorin Oakenshield (Richard Armitage) is supposed to be the great leader and mighty warrior we all marvel at, but nothing in his actions actually backs this up. There is a way to have a jerk be the person you root for, but Jackson fails in this task. He also fails to make our lead, Bilbo Baggins (Martin Freeman) particularly interesting. There's an old joke that says that Indiana Jones is not at all instrumental in what happens in his own movies, and throughout The Hobbit that same joke applies. Bilbo just feels like a minor character of his own movie -- which is especially strange when considering that some of the dwarves in this movie get to have a complete story arc from start to finish. Bilbo definitely changes -- the One Ring has that power, after all -- but he, like Frodo before him, is probably the most boring character in the film. Is it possible, maybe, that all this Lord of the Rings stuff has simply run its course? Not entirely. The hashtag #OneLastTime was being used as part of the marketing for this movie and there is indeed reason to get a little teary-eyed given the impact these movies have had and how long it's taken to make them all. What's sadder is that this all feels like such a terrible send-off for this movie series and story: After the battle is over, we simply rush to the end in an awkwardly edited montage; it's a wholly dissatisfying goodbye. Or is it? These new movies have made enough money throughout their run. And, no doubt, there's still enough material out there from The Silmarillion and other appendices for the studios to make more LOTR movies. But, just as Star Wars eventually conceded, it's clear that LOTR's second trilogy could've benefited from some new blood at the helm.